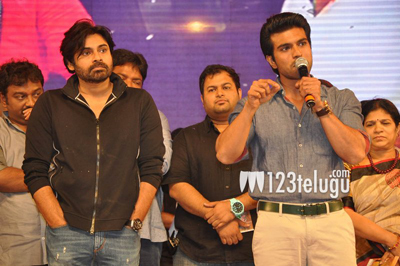 Why did Charan turn so emotional? Mega Power Star Ram Charan’s emotional outburst ,at the ‘Naayak’ audio launch ceremony, has become a topic of intense discussion among industry and media circles. While speaking on stage, Charan accused certain sections of the media of trying to create differences in his family. The common question being heard is, ” Why did Charan turn so emotional?”. Was it the absence of Megastar Chiranjeevi at the audio launch yesterday? Was it the presence of Power Star Pawan Kalyan at the event? Was it the sense of unity projected by the presence of most of his family members together on the stage at once. Perhaps, Charan was reminded about the controversies that erupted after his uncle Pawan Kalyan failed to make an appearance at the ‘Raccha’ audio function. Only Charan will be able to reveal the true reason behind his emotional words. Many expected Pawan Kalyan, who addressed the crowds after Charan spoke, to make a statement or two on the topic. But the Power Star only made a few general statements in a dignified and soft manner. He termed all members of the Film Industry as his family and wished the team of ‘Naayak’ the very best.